I was looking forward to the age I could take my baby for swimming classes. A local pool offered classes from 3 months of age which might seem too young, but our son really liked it from the first time we went in! The pool, like most pools with infant and children swim classes, requires “double diaper” policy – meaning a reusable swim diaper over a disposable. 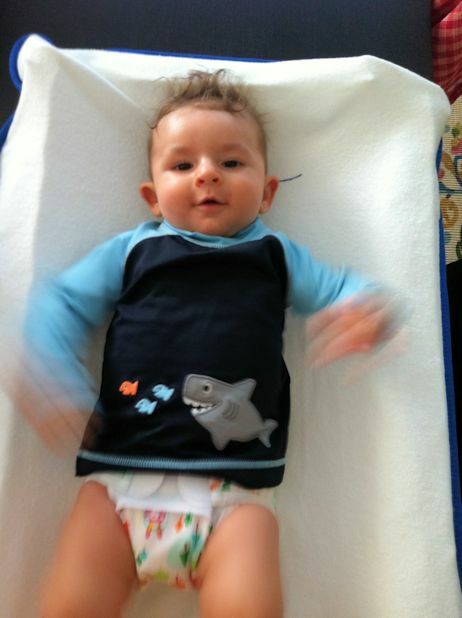 We have been using cloth diapers since Aditya has been 2 weeks old (before that he was too small for the ‘small’ size) and one of the reasons was keeping a one-time item out of landfill. Plus have you checked out the prices for disposable swim diapers? Insane and insane! First I use a cheap reusable diaper that I actually got as a gift when we were staying in some hotel (it was part of their kid’s amenity), very similar to “i play” brand. You can get “i play” at almost any kids store and major department stores. 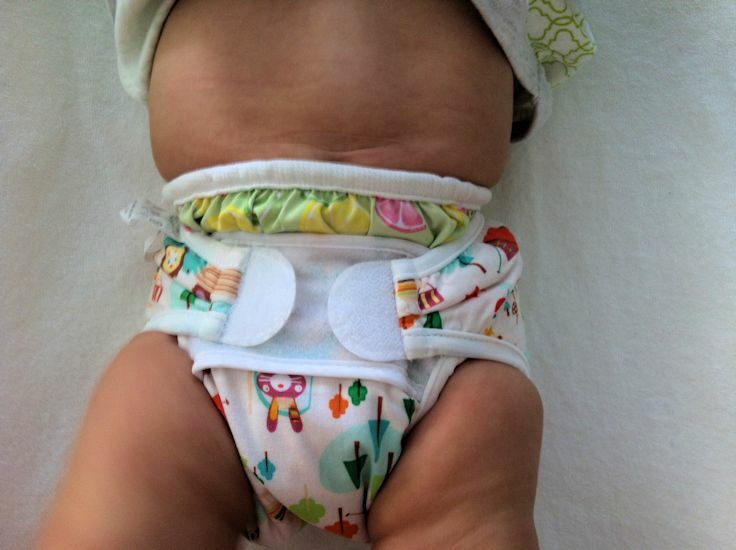 I insert a fleece liner or a small cloth insert (also known as “doubler” or “booster” in the cloth diapering community) into the diaper. Reason? 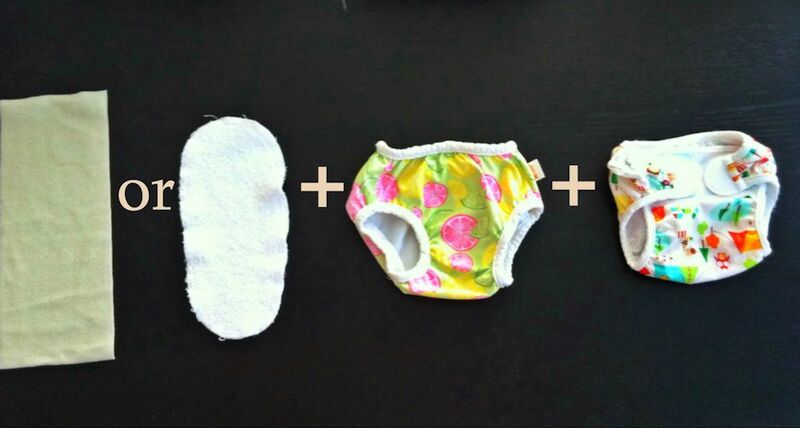 If there is a small poop in the diaper, I don’t have to wash the whole thing, but throw the liner into the laundry bag with other cloth diapers and rinse the cover unless it is soiled. It also gives me the feeling of security that there is an extra layer that will encourage the poop to adhere to. I use Bummis brand for cloth diapering, so I use their liners and boosters too (both available on Amazon and major cloth diapering sites). Now the staff at the pool sees that we are really wearing two diapers – no cheating here:) And by pulling the top part up a little I am pretty sure that Aditya won’t get his skin scratched by the velcro (it doesn’t happen often, but some reviews mention it, so I thought I didn’t want to find out, if it happens to my baby;))) – every child’s body is different, so even the diaper will fit slightly differently on each). Again I use Bummis, I love the prints they have (AND their reviews are great)! And then we just top it off with a rash guard if we’re in the outdoor pool and voila! Happy poop-proofed baby! This post contains affiliate links from Amazon.com. I never link to products I would not recommend based on personal use or products I believe are not healthy/ eco friendly/ ethical.